In the smorgasbord of corporate earnings out this week, food and beverage companies were on the menu Tuesday. The Coca-Cola Company (KO) reported that earnings rose 4% in the third quarter, to 50 cents per share, while sales rose only 1%, to $12.3 billion. Shares of the world's largest beverage company were down slightly in midday trading. On StockTwits, some users were disappointed that Coca-Cola didn't see more growth in China and Europe. But others were happy to step in and buy the stock at a discount. SeekingBennyFrank: @knoxdogs hmmm, thanks, id buy $KO at 36$. Despite some weakness in the soft drink sector, Domino's Pizza business was booming, according to its third-quarter results. The mass market pizza seller said it earned 43 cents per share in the third quarter, up from 35 cents in the same period last year. In addition, Domino's (DPZ) said sales at U.S. stores open at least one year rose 3.3% for the quarter. Overseas demand was also strong, with same-store sales at international locations up 5%. During the third quarter, Domino's opened 121 stores outside of the United States. 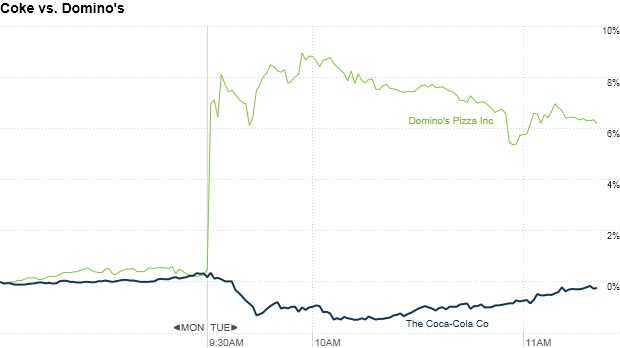 Domino's was up more than 6% in midday trading.